Until 1975, what is now Independence Park in Baton Rouge was part of the city's Downtown Airport, devoted to small planes rather than large commercial aircraft. After the airport was relocated from the mainly residential area, portions of the 200 acre site were designated by the City-Parish Council for a public park to be run by the Recreation and Parks Commission, BREC. 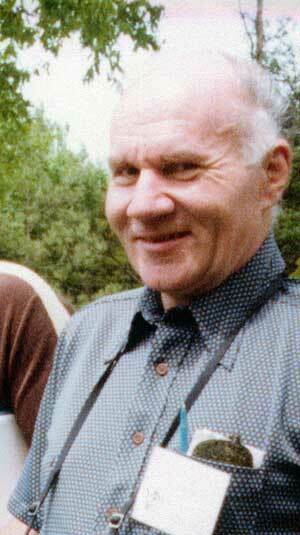 The Park was dedicated in 1976, but the Botanic Garden did not take shape until the late 80s. 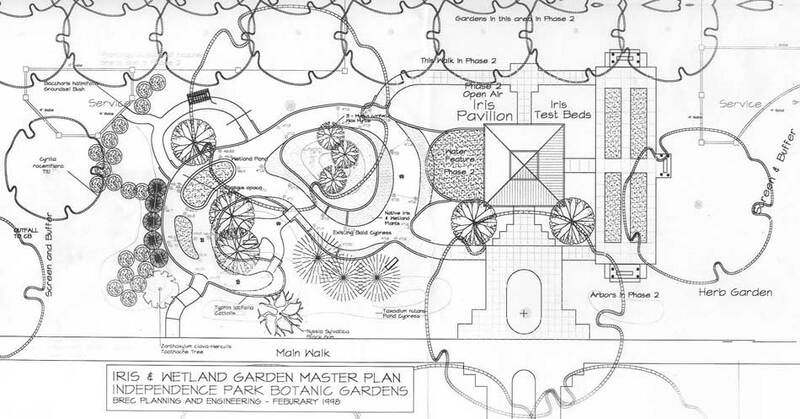 In 1988, Baton Rouge Green raised funds for a revised Master Plan for the Park, and that Plan included fifteen acres for a Botanic Garden. Naturally, a former airport presented a blank slate for plants. No stately oaks or interesting stands of natives, only the opportunity to imagine a beautiful future, to plan and create it. Working with sponsoring community groups and interested gardeners, BREC has developed a Garden featuring sections dedicated to particular types of plants. These include Rose, Camellia, Crape Myrtle Gardens, as well as a Butterfly Garden and a Sensory Garden devoted to herbs. A fine collection of daylilies has been interspersed in recent years on berms among the Louisiana irises. 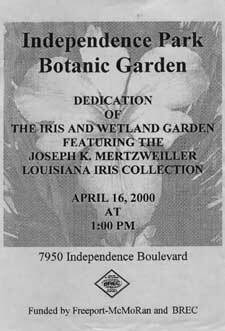 The Louisiana Iris Garden was the last dedicated, in April 2000, two years after Joe Mertzweiller's death at age 76. Joe was very active on the front end of the development and had been instrumental in creating an earlier version of the Louisiana Iris Garden. Working with Joe, BREC in 1994 scooped out an area about 75 feet in diameter, creating bog-like conditions for the water loving irises. Joe donated plants from his garden and collected others from such Louisiana iris experts as Marie Caillet of Little Elm, TX. And the first Louisiana Iris Garden was born in the shallow pond.. The original planting proved difficult to maintain and access, however. A visitor could walk around the perimeter, but only those irises near the edge could be closely viewed without venturing into the bog. And weed control proved very problematic. Eventually it was decided that the iris garden should be more formally designed and allow visitors to walk through on paved paths that put them in the midst of the irises. 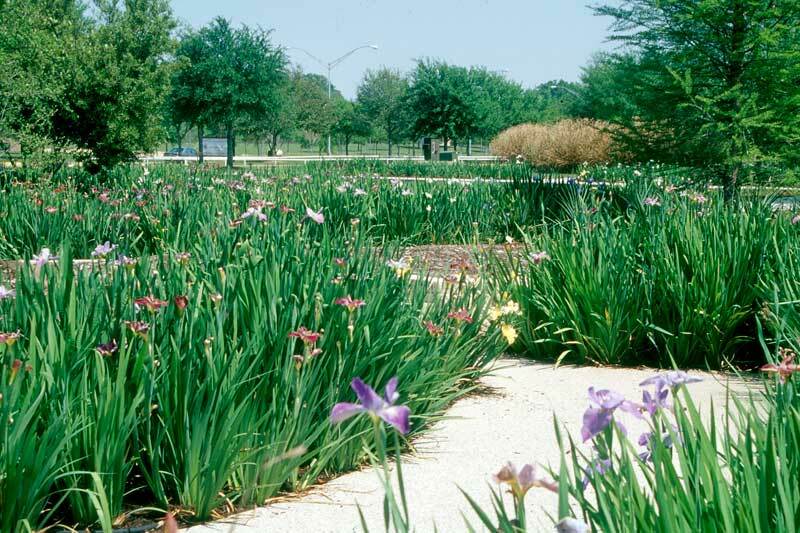 With funding by BREC and Freeport McMoran, a new plan was developed and a redesigned Louisiana Iris Garden was dedicated on April 16, 2000. The pictures on these pages show the bounty of this garden over the years. Two articles in the journal of the Society for Louisiana Irises, available as pdf files cover in more detail the development of the Louisiana Iris Garden (500k) and the dedication event (300k). 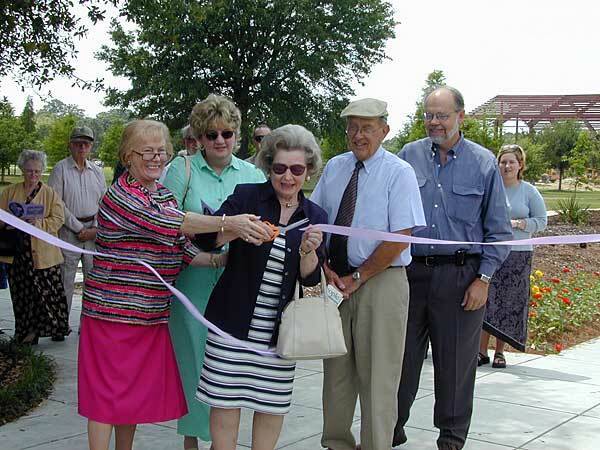 Helene Mertzweiller cuts the ribbon at the Louisiana Iris Garden dedication. The design, construction, funding, and maintenance of the Louisiana Iris Garden have involved many people and organizations as well as individuals with a particular interest in irises. The Baton Rouge Botanic Garden represents a successful example of public-private partnership. Ownership and primary responsibility for the Botanic Garden rests with the Baton Rouge Recreation and Parks Commission, BREC. The Master Plan, approved by BREC and the Botanic Garden Foundation, is in implementation by phases as funding is available. Private donations have been made, and a Friends group regularly raises money for the Botanic Garden through plant sales. BREC funds and provides general maintenance through a landscape crew that works in cooperation with volunteers. 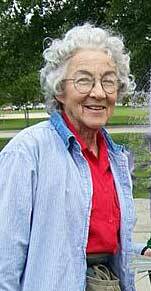 In the Louisiana Iris Garden in recent years, the face most likely seen is that of Claire Fontenot, a Master Gardener who has coordinated volunteer work. She organizes the activities of other volunteers, pots plants for Friends' sales and has attacked the herculean task of identifying and preserving particular cultivars that, left alone, grow into each other's space. Without such diligence, the most robust growers encroach upon less vigorous but unique irises, and the diversity of forms and colors is diminished. Part of the charm of the Garden is the free-flowing mix of colors, but the work of the volunteers is essential to ensure that the wide variety of irises will endure. The Master Plan for the Louisiana Iris Garden envisions expansion in later phases, but plans, while critical, are mainly about infrastructure. The Plan is in black and white, but people provide the color. The future of the Garden as a beautiful, educational spot in large measure depends on the kind of voluntary efforts that bring life and order to hard structure: Joe Mertzweiller's early contributions, the subsequent work of Art Landry and James Jeansonne, and the continuing efforts of volunteers such as Claire Fontenot and others. The future of the Louisiana Iris Garden will depend upon both BREC and the community of gardeners willing to help.